Raketoplan designs. From left to right: Low L/D re-entry vehicle (LK-1 circumlunar spacecraft as flown); High L/D re-entry vehicle with containerised winged lander inside jettisoned aerodynamic shell; High L/D re-entry vehicle, advanced (provisional, based on LKS design that followed). Russian manned spaceplane family. Succeeding the VKA project, this was developed by Chelomei from 1959, including suborbital hardware tests, before cancellation in 1964. Succeeded by the Spiral program. AKA: R. Status: Cancelled 1964. Gross mass: 6,300 kg (13,800 lb). Height: 10.00 m (32.00 ft). Span: 4.15 m (13.61 ft). The Raketoplan manned spacecraft design would re-enter the atmosphere in a heat shield container, which would be jettisoned after the spacecraft had passed through the period of maximum heating. Swing wings would then be deployed, and the spacecraft would glide to a horizontal runway landing. 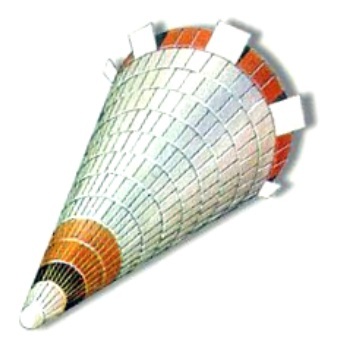 The heat shield itself was shaped like an asymmetric cone. This shape could provide lift during re-entry and maneuver with the assistance of rudder petals at the base of the cone. 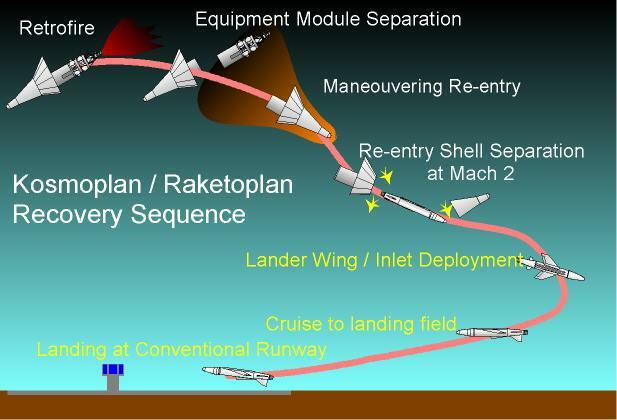 This approach reduced aerodynamic resistance during re-entry and reduced the hot structure of the Raketoplan by ejecting the heat shield after re-entry. Chelomei began preparatory theoretical work on manned spacecraft in the late 1950's. This analysis was a necessary prologue to later development. Various solutions for recovery of the spacecraft were considered: fixed wings, automatically deployable wings, and lifting body shapes. The best technical solution was completely original and received a patent. Decree 715-296 of 23 June 1960 'On the Production of Various Launch Vehicles, Satellites, Spacecraft for the Military Space Forces in 1960-1967' authorized Chelomei's OKB-52 design bureau to prepare a draft project for a manned Raketoplan spacecraft for orbital maneuvering flight and recovery at conventional airfields. At that time total mass was to be 10 to 12 metric tons, total gliding range during re-entry 2,500 to 3,000 km. An unpiloted version was to be designed in 1960 to 1961, followed by a piloted version in 1963 to 1965. Completion of the final draft project was planned for 1965. Actual hardware development and flight trials would only take place in the second half of the 1960's. Sub-scale prototypes of the satellite interceptor operational version were to be tested in 1962 to 1964. The full-scale lifting manned spacecraft would conduct interception, inspection, and destruction of US satellites up to 290 km altitude. It would have a two man crew, a 24 hour mission duration, and was equipped with large aft drag brakes. Preliminary designs of a similar nature had been completed under the VKA project at the Myasishchev and Tsybin design bureaus, which were closed and their staff absorbed by Chelomei in October 1960. During development of the draft project progressively more complex models of the design were flown. First to be tested was the sub-scale MP-1, with a mass of 1750 kg. This had the oblique conical heat shield, with an arrangement of 'tail feathers' on the stern that looked like a deployable umbrella. Tests of this model would verify the predicted aerodynamic characteristics of the design, test the heat shield material, and measure the minimal temperatures and vibrations experienced in actual flight. The MP-1 was boosted by an R-5 rocket to an altitude of 405 km in late 1961. It re-entered the atmosphere 1760 km from the Kapustin Yar launch site at a velocity of 3800 m/s. The test flight produced valuable material on aerodynamic and heating characteristics. The second flight test was of the more sophisticated M-12 sub-scale unpiloted version took place on 21 March 1963. This had a mass of 1700 kg, and the fixed 'umbrella' tail fathers were replaced by movable rudders to test maneuverability of the design at hypersonic speeds. This test provided additional actual data of the aerodynamic characteristics which were necessary to complete the draft project. By the time of the 1963 draft project for the intended launch vehicle, the Proton UR-500, Chelomei had expanded the Raketoplan concept to cover a broad spectrum of modular spacecraft, destined to solve defense, scientific investigation, and national economic tasks. These all were to be called Raketoplans - piloted spacecraft for solving military tasks in space. For example, orbital Raketoplans were intended to fulfill intelligence, satellite inspection, and destruction tasks. For these purposes the Raketoplan was to be equipped with an orbital maneuvering engine, targeting systems, rendezvous systems, and space-to-space weapons. Later Raketoplans would be used for scientific tasks, including flight to the moon and return to earth, and economic exploitation of near-earth space. Due to their high lift to drag ratios, Raketoplans could, after completing their tasks in space, make a guided descent into the earth's atmosphere with a landing on Soviet territory. The re-entry vehicles for the Raketoplans could be of three types: a low hypersonic lift-to-drag ratio capsule; a moderate lift-to-drag ratio ballistic or polyballistic shaped body; and two versions of a spaceplane with a high lift-to-drag ratio. The first version of this last design represented the original and still-favored concept: the heat shield container would be jettisoned after the spacecraft had passed through the period of maximum heating. Swing wings would then be deployed, and the spacecraft would glide to a horizontal runway landing with the assistance of a turbojet engine for go-around in the case of a missed approach. At a later stage the second version, a fixed wing Raketoplan, would be used, which could maneuver over a wider cross range and ensure a quick landing on Soviet territory from almost any orbit. In 1964 Chelomei had submitted to the VVS the advanced project for a single-place Raketoplan, which would be launched into low earth orbit using a Korolev Soyuz launch vehicle or (preferably) the Chelomei UR-500. This final design came in two versions. The unpiloted R-1 would fly first, and would be used to check out and test all systems in orbit. These included wringing out the orientation and stabilization system, the engines, proving the reliability of the systems, measuring the arrangement of the jettisonable section and the dynamic characteristics of the whole vehicle, and test of the heat shield and its aerodynamic parameters. The piloted R-2 would be used to solve problems of the capabilities of pilot-cosmonauts to control the spacecraft both in orbit and aerodynamic flight; to test communications systems; and to conduct reconnaissance and inspection functions in space. 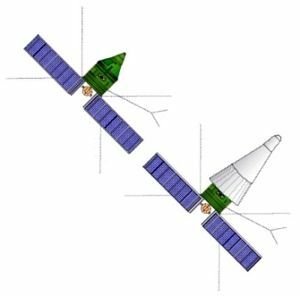 Both the R-1 and R-2 would have a mass of 6300 kg in a 160 km x 290 km orbit, a flight duration of 24 hours, and use lift on re-entry to keep forces under 3.5 to 4.0 G's. In October 1964 Khrushchev was ousted from power and the new leadership, under Brezhnev, was adverse to all that Khrushchev had supported- including Chelomei. An expert commission under M V Keldysh examined Chelomei's projects and recommended that the Raketoplan project be cancelled (although work on one variant of the ballistic design, the LK-1manned lunar flyby program, continued). 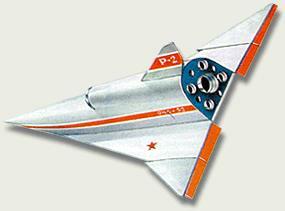 The Mikoyan MiG design bureau was assigned the responsibility for further development of Soviet manned spaceplanes. The materials prepared by Chelomei for the Raketoplan were handed over to OKB MiG, as well as many of the engineers that had worked on the project. Lozino-Lozinskiy was named head of the new unit at MiG, which would design the Spiral lifting body by the end of the 1960's. Chelomei would be excluded from further work on the topic for ten years, until he proposed his LKS spaceplane as an alternative to the Buran space shuttle. VKK Russian manned spaceplane. Study 1998. A Russian concept of the 1990's harking back to Chelomei's Raketoplan of three decades earlier. A manned aircraft would be protected during launch and re-entry by an expendable aeroshell heat shield. Family: Spaceplane. Country: Russia. Launch Vehicles: R-7, UR-200, Proton-K. Agency: Chelomei bureau. Bibliography: 191, 273, 283, 376, 453, 474, 83, 98. 1958 July 2 - . Launch Vehicle: R-7. R-14 IRBM, R-7A ICBM, and Raketoplan development authorised. - . Nation: Russia. Spacecraft: Raketoplan. Central Committee of the Communist Party and Council of Soviet Ministers Decree 726-346 'On start of work on the R-14 missile, on creation of the R-7A ICBM, and on creation of the winged-ballistic rocket at OKB-52' was issued..
1959 December 10 - . Raketoplan development authorised. - . Nation: Russia. Spacecraft: Raketoplan. Central Committee of the Communist Party and Council of Soviet Ministers Decree 'On the Development of Research on Cosmic Space-future of Soviet space program (piloted. interplanetary, spaceplane)' was issued..
1961 March 11 - . New manned spacecraft - . Nation: Russia. Related Persons: Vershinin. Spacecraft: Raketoplan, Sever, Vostok-Zh. The VVS TTZ requirements document for the next generation Soviet manned spacecraft is approved by Vershinin. It is to accommodate two cosmonauts, have a launch mass of 6.5 to 7.0 tonnes, be capable of manoeuvring and changing its orbit at altitudes of 270 to 300 km altitude. The TDU engine is to be restartable, and the spacecraft will have a system to reliably change and hold its orientation in flight. The crew will be returned in a pressurised spherical re-entry capsule, but still be provided with ejection seats for separate landing of the crew in emergencies. The craft will be capable of flights of 15 to 20 days duration and be equipped with redundant communications systems. Kamanin points out the necessity of coordinating the TTZ with OKB-1. Vershinin and Ponomarev fight over whether to consider Chelomei's Raketoplan as meeting the requirement. Kamanin's position is that Korolev's Vostok is now flying reliably, while the Raketoplan is a 'crane in the clouds' - it might come to them some day, but who knows when. 1962 December 13 - . Military-Scientific Conference on Military Space Applications at the Zhukovskiy Academy - . Nation: Russia. Spacecraft: Raketoplan, Spiral OS. The three-day conference hears papers describing advanced military concepts, including quantum generators, orbital aircraft, air launch of manned spaceplanes, and so on. Studies show that orbital aircraft would be more effective than ballistic missiles in attacks against small-size targets on the earths surface (such as ships, ICBM silos, etc). Nine ICBM's would be needed to destroy such a target, as against only two orbital aircraft. Kamanin's opinion: a lot of talk, but no action. Raketoplan model launched atop R-12. - . Nation: Russia. Spacecraft: Raketoplan. Raketoplan model reached 400 km altitude, re-entered at 4 km/sec. Flew a total distance of 1900 km before being recovered by parachute. First test flight of a lifting re-entry vehicle in the world..
Raketoplan canceled. - . Nation: Russia. Spacecraft: Raketoplan. Decree 'On end of work on the Raketoplan at OKB-52' was issued. This action was in accordance with the Five Year Military Space Plan approved on 18 June 1964..